Fairy tales often have their fair share of macabre scenes and plot points (Little Red Riding Hood’s grandmother being cut alive from the body of a wolf, for instance, if the pair survive at all ...), but when stories are adapted for stage and screen, often some of their darkest elements have to be omitted for the sake of the audience. 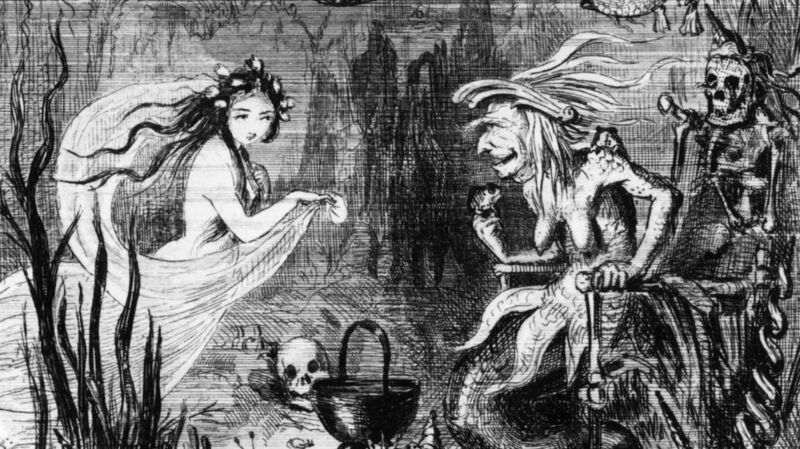 Things don’t always end happily ever after, however—as these original endings to three of the most familiar of folk tales prove. Hans Christian Andersen’s tale of a beautiful mermaid princess who longs to be a human was first published in 1837. The version best known to most people, however, will doubtless be the 1989 Disney adaptation, which won two Oscars and was nominated for a third in 1990. Anderson’s story, however, is considerably darker than that. The mermaid can’t bring herself to kill the prince she loves so much and dies. But rather than turn into nothing but sea foam, she becomes a “daughter of the air,” and joins a group of beings who, like mermaids, lack souls, but unlike mermaids can gain souls and enter Heaven. If that sounds like a happy ending, however, there’s one final caveat. As if the scene in Disney’s 1940 adaption of Pinocchio in which the delinquent Lampwick is transformed into a donkey weren’t horrifying enough, the original story—The Adventures of Pinocchio (1881-83), by Italian novelist Carlo Collodi—includes some even more gruesome details. For one, when Pinocchio first runs away from home, he bumps into a local policeman who quickly decides that Geppetto has been abusing him, and has the old woodcarver thrown in jail. When Pinocchio returns home, the talking cricket who has lived in Geppetto’s house for decades begins to teach him the errors of his ways—but unlike in the animated version, the literary Pinocchio soon tires of the cricket’s sermonizing and kills him with a mallet. Most unnerving of all, however, was the story’s original ending. "They tied Pinocchio’s hands behind his shoulders and slipped the noose around his neck. Throwing the rope over the high limb of a giant oak tree, they pulled till the poor marionette hung far up in space. Satisfied with their work, they sat on the grass waiting for Pinocchio to give his last gasp. But after three hours the marionette’s eyes were still open, his mouth still shut and his legs kicked harder than ever. "Tired of waiting, the assassins called to him mockingly: 'Goodbye till tomorrow. When we return in the morning, we hope you’ll be polite enough to let us find you dead and gone and with your mouth wide open.' With these words they went." “'Oh, Father, dear Father! If you were only here!' These were his last words. He closed his eyes, opened his mouth, stretched out his legs, and hung there, as if he were dead." Understandably, that ending proved a little too bleak (and the series as a whole a little too popular with readers) for Collodi’s editor to leave it there. Two weeks later, the newspaper published a notice, explaining that “Signor C. Collodi’s friend Pinocchio is still alive … Therefore, our readers are warned: soon we will start with the second part of The Adventures of Pinocchio.” Collodi picked up the story where it had finished, had the Blue Fairy come rescue Pinocchio, and the more familiar, happier ending was added. Versions of the Cinderella story have been told for hundreds of years, with one version—the Chinese folk tale Ye Xian—dating back as far as the 9th century. But the version best known to western audiences is probably that based on Cendrillon, a story written by the French author and scholar Charles Perrault in 1697. Perrault’s version includes much of what we would recognize of the story today—with the notable exception of the ending. When the handsome prince arrives at Cinderella’s home to see if the glass slipper fits her or her sisters’ feet, her stepsisters are determined that it should fit them, with it long being interpreted that they cut off parts of their own foot. "When the bridal couple walked into the church, the older sister walked on their right side and the younger on their left side, and the pigeons pecked out one eye from each of them. Afterwards, as they came out of the church, the older one was on the left side, and the younger one on the right side, and then the pigeons pecked out the other eye from each of them. And thus, for their wickedness and falsehood, they were punished with blindness as long as they lived."